"We love all of humanity." Mysterious chat room messages, all posted under the name "Saika," profess love for humanity-and for one man in particular. Saika's target: Shizuo Heiwajima!! Over fifty people have been struck in the worst case of serial slashings in the history of Ikebukuro. But the slasher's victims have tasted not only the blade, but also the vision of their attacker. A vision of love, love, love that can only be realized when their own blades have pierced the body of their beloveds. 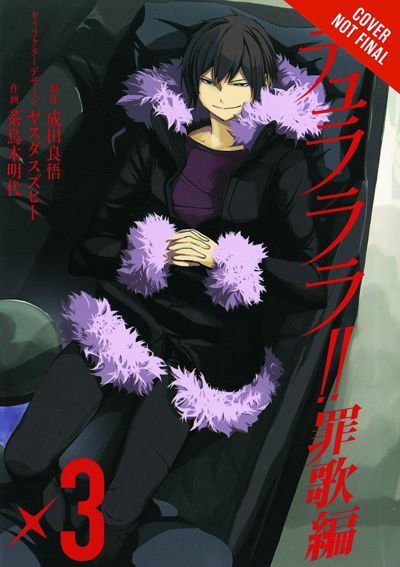 Shizuo braces himself for a battle to the death in the shocking climax of the Saika Arc! !